Ada soalan mengenai The Benjamin? Ketika melawat Durban, anda akan merasa seperti di rumah di The Benjamin, yang menawarkan penginapan berkualiti dan perkhidmatan hebat. Terletak 3.0 Km dari keseronokan bandar, hotel 4.5-bintang ini terletak di lokasi yang sangat baik dan menyediakan akses kepada tarikan terbesar di bandar. Hotel moden ini berada di sekitar kawasan tarikan bandar yang popular seperti Tekweni Eco-Tours, Greyville Racecourse, WowZulu. Di The Benjamin, segala usaha dilakukan untuk membuatkan tetamu berasa selesa. Oleh yang demikian, hotel ini menyediakan perkhidmatan dan kemudahan yang terbaik. Ketika menginap di hartanah yang indah ini, para tetamu boleh menikmati Wi-Fi percuma semua bilik, Wi-Fi di tempat awam, tempat letak kereta, khidmat bilik, pengangkutan lapangan terbang. Semua penginapan bagi tetamu menawarkan kemudahan yang difikirkan dengan teliti bagi memastikan rasa selesa yang sukar ditandingi. Sama ada anda peminat kecergasan atau hanya mencari cara untuk bersantai setelah seharian bekerja, anda akan dilayan oleh kemudahan rekreasi kelas tertinggi seperti kolam renang terbuka, taman. Apapun alasan anda untuk melawat Durban, The Benjamin adalah tempat yang sempurna untuk percutian yang menyeronokkan dan menarik. 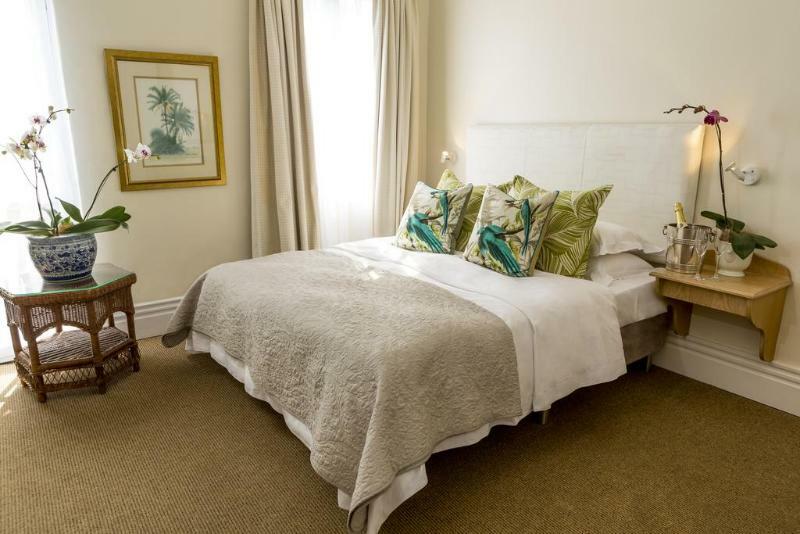 A nice boutique hotel on the same street as some of the best restaurants in town. So loud. Either the guests were partying in the courtyard. Or the night club was blasting from next door. So so loud. Dear Emily We are sorry that your stay was affected by the street noise. It is a very busy time in Florida Road and we understand it is not everyone's cup of tea. We hope you enjoyed our hospitality though. I greatly appreciated the flexibility and willingness to make a plan at the last minute when I requested an early check-in arrangement. Thank-you for the wonderful review Claire! Super clean, uber-friendly staff, right on Florida Road in the middle of all the restaurants! Thank-you Sameena, glad you enjoyed it. Staff were friendly andprofessional. The bed was very comfortable. Food was excellent. It was very comfortable and I had all that I needed. We came back to the Benjamin because our first stay a year earlier was great. They did not disappoint. The location couldn't be better, and although there is some noise from the bars outside (mostly Fri and Sat night), we were able to shut it out by just closing the windows. The staff is friendly, courteous and professional. Breakfast was ample and always good. We will be booking again on our next visit. All in all, this is a very good choice of accommodation to stay in Durban. The street it is located is apparently a social nightlife area and has many restaurants and bars. The downside is that by Thursday, I can hear the thumping of a heavy house music from my room, although it is not very loud (thankfully). The hotel is charming and the staff, in general, are friendly and so e are very nice and helpful (not all). The room is in need of a good cleaning with perhaps new carpets and a good renovation. The carpet in my room does not smell very nice and the French window does not close well. The bed is comfortable and the wifi does work well. Despite little hiccups, it is a good, recommendable place to stay. The best point of the hotel is the staff at reception. It was a lovely stay at the Benjamin. My husband & I walked up Florida road to have dinner at Spiga D'oro Italian restaurant. It was safe and we enjoyed it. The staff at the Benjamin were kind and friendly and breakfast was amazing. The only negative thing was the room that we stayed in was far too small and not value for money. It was lovely. The only thing - there was a bit of damp in the room (I forgot to mention to management) - so when we came in, we were hit with a wiff!! otherwise - absolutely great! I would happily stay here again. Good value, comfortable and clean. It was a good stay. If anyone is planning to be in Durban for business, this is a good choice to stay. its very close to sum good restaurants. Staff was excellent, breakfast was generous, hotel is clean and nice. Excellent hotel iwithnattentive staff in a god location.